Codenames gets a clean bill of health here. Dealing with the spymaster grid is going to be a very slight problem for those for whom monochromacy is to be considered, but for those with the more common categories of colour blindness there won’t be an issue. Let’s do the usual thing and work through the key areas. First of all, the coloured agent cards are appropriately differentiated for all categories of colour-blindness, and even for those where there is no ability to discriminate colour. Each card type has unique artwork to go with it. The double agent (shown here as a blue agent with red glasses) is the only character for whom that’s not true, but her glasses are visibly distinct regardless for anything short of true monochromacy. Do we know who these mysterious yellow agents work for? 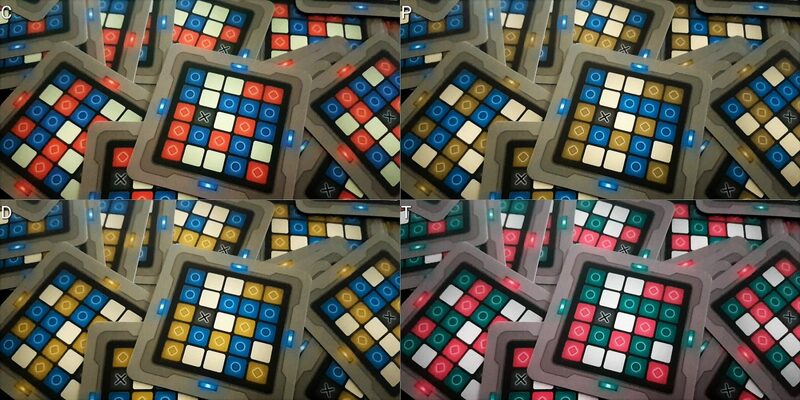 The spymaster grids likewise are appropriately differentiated for all categories of colour blindness, and the different colours are paired with different symbols. That’s great, although I would have liked to have seen these being more distinct – triangles and circles for example – to deal with intersectional issues associated with visual acuity. Still, that’s a relatively minor complaint, and we’ll get to it. The actual clue cards themselves contain no coloured information, and as such they too are perfectly accessible to those with colour blindness. 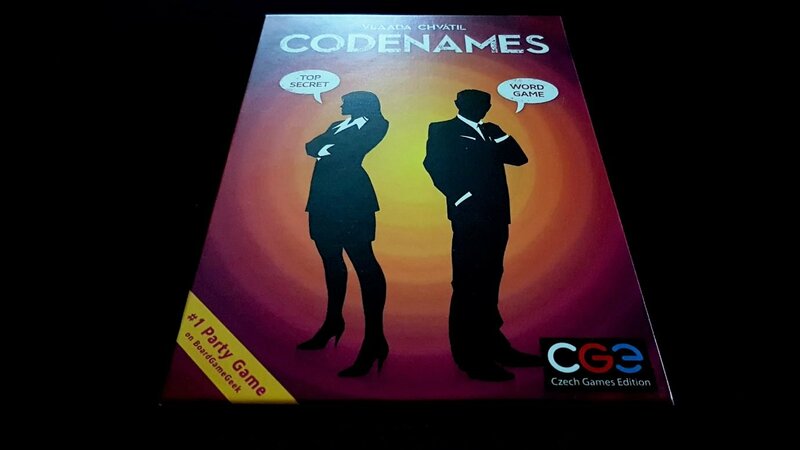 We strongly recommend Codenames in this category, and congratulate Czech Games Edition for their attention to detail in this regard. The extent to which the game is visually accessible depends both on the role being undertaken, and the specifics of the playing area. Making use, as it does, of a 5×5 grid it’s possible for this to be more tightly constrained if desired by bringing cards into closer proximity with each other. The text on the cards is generously proportioned and well contrasted, making use of a clean and unornamented font – largely ideal, in other words. However, if visual acuity is low it’s going to be difficult for a spymaster to view the coloured grid and match that up to individual cards. It’s going to be difficult for spymaster and field operatives to scan the grid for the connections between words. This is an issue of combinatorial explosion. Simple clues won’t be as much of an issue, but if you want to permit subtle, clever play then the relationships may be difficult to ascertain unless you can rapidly scan the grid and compare many words against many other words. However all is not lost here. The nature of the game lends itself well to play with a supportive aid such as a local copy of a spreadsheet where the words are represented. It would add a little bit of setup time, but there are only twenty-five words in play per game, and that’s well within the reach of a feasible compensation. That way, close inspection of cards becomes possible in all circumstances. If playing as the spymaster, a standard cell formatting regime can even permit the text to be appropriately coloured. If done in the right kind of way, it would even work with standard speech to text setups. This wouldn’t be appropriate for many games, but the tight constraints of the grid and the single word contents of the cards in Codenames makes it a sensible proposition. There are even automated generators available to create digital grids. You can download these tools over at Boardgame Geek. We’d be prepared in any case to offer a tentative recommendation for Codenames in this category in terms of the base set. We’ll bump that up to a full recommendation because if you want to make the effort it it’s not difficult to put together a supporting regime that permits accessible play in this category. The proper game of Codenames is filled to the brim with cognitive costs. Game flow is moderately consistent, but modified by a few ‘expert clues’ that can be used to offer those on the guessing side a little flexibility. For example, you can use ‘zero’ as a number which means ‘none of the words relate to this thing here’. It then permits field operatives to make as many guesses as they like. This is useful if they’ve failed a few clues already and need some disambiguation. It does though put an uncertainty on turn length. Similarly with the ‘unlimited’ clue, which allows operatives to make an unrestricted number of guesses based on previous information. Both of those options tax memory faculties since they imply information from previous rounds is going to be of value in the existing round. There is no graceful state representation for previous clues. You can though write them down of course. Let’s kill some bystanders! I mean, save some bystanders! I pick those because that’s what a spymaster grid I drew would provide you as a task. Now, you’re on to something of a winner here – calf, mouse and buck would all potentially be excellent for ‘animal, 3’. They would be except there’s also a shark on the table. So, you need a connection between the three animals you have that excludes a shark. You could go for ‘mammal’, but that relies on both the spymaster and field operatives knowing the sharks aren’t mammals. It also relies too on the word ‘buck’ being understood as a male deer. What about ‘Leg, 2’ – that would be fine for calf and foot, but what about horseshoe? You often need to deal with words that have a flexible meaning and words that are definitionally adjacent to the clues you are providing. ‘Nest, 2’ might work for mouse and straw, but again it requires a relatively complex ability to do free-form linguistic association. For the other player, they might go for ‘Marie Celeste, 2’ for ghost and ship. This requires a fair degree of historical context and knowledge as well as awareness of the fact proper names (permitted in the rules) may be made up of multiple words. The more obscure your clue, the more effective it is for the right team. However, the more demanding it becomes in terms of linguistic fluency and general knowledge. The cost is in terms of making the connection between words, rather than in the words themselves. This is very much the heart and soul of Codenames and it’s not a simple task. It’s especially difficult when you honour the various rules that go into what makes a valid clue. We have a reasonably effective variant here if you want to ensure maximum cognitive accessibility. We discussed in the review how with player counts of four or lower it’s best to play as a single team against the dummy player. 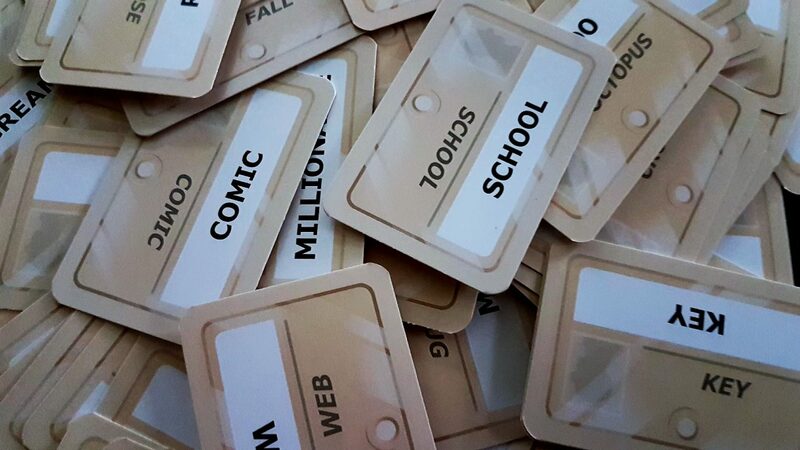 You can also treat Codenames as a simple word association game by removing the competitive element and simply playing to a dummy that you can scale up or down in terms of difficulty. The standard dummy player scores one agent per round. You could make that one every two rounds, or three, or whatever gives an appropriately scaled challenge for the group. With a slower dummy player, you can thrive with even one word clues. While the game lacks its main core challenge it’s still reasonably satisfying and far less cognitively demanding. That said, the game still does require a considerable degree of literacy to play, and there is no way around that – if reading comprehension is a problem, even this accessible variant won’t be a possible compensation. As such, we’re prepared to offer a tentative recommendation for Codenames in the fluid intelligence category, and in the memory category. However, this is predicated on an accessible variant being adopted and all players having reasonable linguistic fluency. If either of those things are missing, the game is likely to be completely inaccessible. Part of the fun and hilarity of Codenames is bundled up in the ability of everyone to take a joke at their own expense. The mental disconnect between ‘These are perfectly logical clues’ and ‘These are logical guesses based on those clues’ can be considerable. That gap is dependent on how ‘cleverly’ people are playing. ‘Feline, 1’ will lead someone safely to ‘cat’, but that’s not a very impressive play. The more adventurous you’re prepared to be, the greater the cause for triumph or comedy. The ability of players to laugh at themselves is critical, especially as failures will become part of the emerging meta-discussion. ‘Oh, Michael thought a shark was a mammal, so let’s make a joke about it every time his clue relates to animals’. That’s part and parcel of Codenames. What Codenames also requires is a certain degree of psychological resilience on the part of the spymaster. They’re going to be the focus of the game as long as they’re in the hot-seat, and that focus can be intense. People are waiting on the clue, and the longer you wait the more they’ll be expecting. Spending two minutes poring over the board to give a one card clue can be embarrassing. That’s especially true if your opposite number is casually linking together two, three, or even four cards per turn. You can almost always come up with a clue, but it’s much more difficult to come up with a clue that works for multiple words. As such, there’s a significant score disparity when teams are made up of players of different skill levels. Being good at making these connections doesn’t necessarily imply someone is more intelligent, but it can certainly be difficult to shake that impression if you’ve been on the receiving end of a particularly bad shellacking. That can be a problem for certain categories of emotional distress. As with our section on cognitive accessibility we recommend playing against the dummy player if this is likely to be an issue. That turns Codenames from an intensely competitive game into a cordially co-operative one. With lower player-counts, we’d recommend this anyway The interplay between the spymaster and the team of field operatives is an important element of social play, and you lose that with a 2v2 setup. It’s also just a sensible variant if emotional accessibility is an issue. We’re prepared to offer a recommendation for Codenames in this category. Aside from the distribution of the cards and the placing of agents onto the grid there is no physical interaction required. While it’s not going to be playable if nobody in the group has the physical range of movement required to do these things, it’s otherwise a task best handled by a single player. As discussed above in the visual accessibility section there are even tools available to do this for you if you wanted to play entirely digitally. Verbalisation is tremendously easy, because the game is otherwise entirely verbal. You look at the grid in front of you (which comes with its own stand to obscure it from the field operatives) and then you verbally express the clue and the number. When field operatives guess correctly, an affirmative noise will be sufficient to let them know to cover it with the right coloured card. Similarly for incorrect guesses, bystanders or the assassin – all that’s needed is an unambiguous signal as to the outcome. If playing competitively, the spymasters share the grid and the responsibility for correctly interpreting guesses. 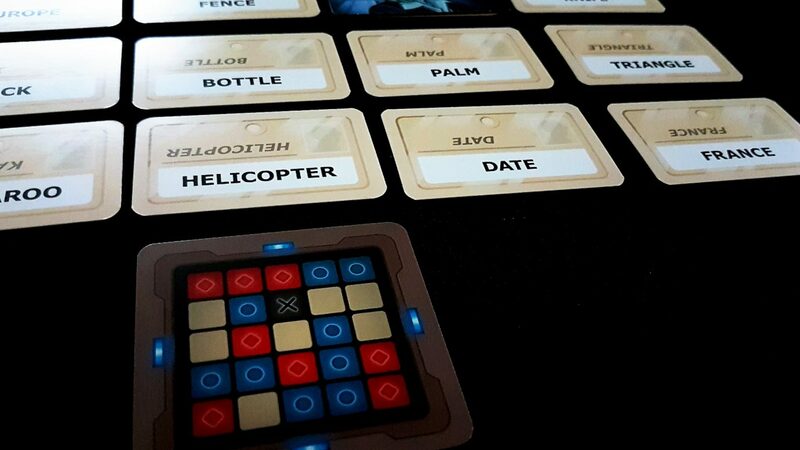 We strongly recommend Codenames in this category. 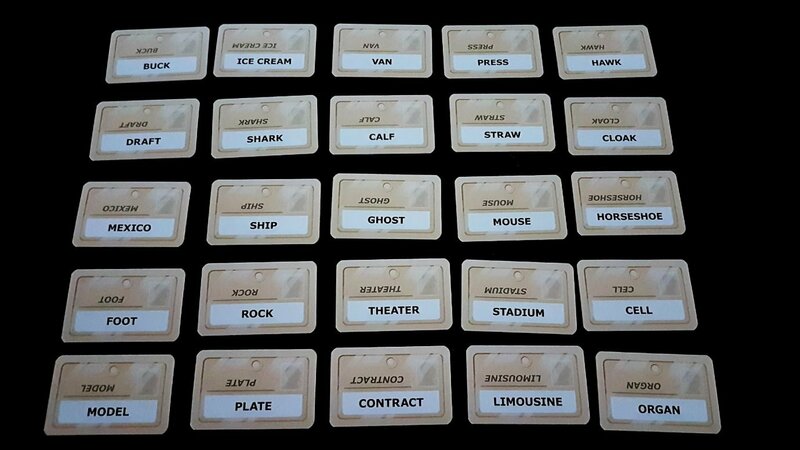 Here’s where we hit the fundamental stumbling block for Codenames – no matter how you try, you can’t get around the fact that this is a game of communication. The reading level required is quite high because of the necessary vocabulary. The associations needed to make good clues require a reasonably solid underpinning of definition, nuance and association, and spelling. Consider our example above of calf, as in a young animal, and calf as in a part of the leg. The exact word in use is going to vary depending on what is situationally convenient. A word may have an assumed meaning in one round that changes in the next. That creates a very significant language barrier that mandates somewhat sophisticated linguistic fluency. For those where the problem may not be in terms of language comprehension but instead in the articulation or interpreting of auditory signals, the story is a little more positive. Clues are only a single word, and while that word may be conceptually nuanced it need not be linguistically challenging. A single syllable clue can be just as powerfully evocative as complex syllabic compounds or proper names. There’s no need really that this even be verbally expressed. It can be a word written down although if it has multiple different meanings it may be necessary to permit a certain degree of disambiguation beyond what the rules permit. So, no recommendation if language fluency is a limiting factor. We do offer a recommendation if communication accessibility concerns are associated with articulation or interpretation of verbal clues. Let’s average it out to a tentative recommendation. If I wanted to be really, really, really nit-picky here I might say that ‘spymaster’ is an unnecessarily gendered term. ‘Handler’ would have worked just as well and been less presumptive. I’d just be doing that to put a slight dent in an otherwise strong performance, so let’s not dwell too much on it and focus instead on everything Codenames gets right. I like to think this is Scully and Mulder. First of all, the box art shows two figures of equal prominence – one woman, one man. That’s good. The manual doesn’t gender its participants, using instead the gender neutral ‘they’. That’s also good. 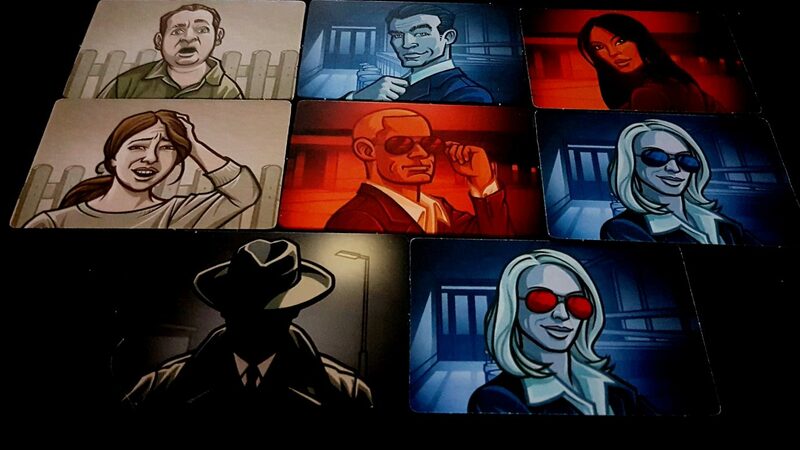 The agents used to cover cards that have been selected by field operatives are double sided, and show a man on one side and a woman on the other – that is, except for the assassin, but that card shows no face. There’s no reason the assassin couldn’t be a woman in a snazzy suit and hat. There’s not a huge amount of ethnic variety on show, but the red female agent certainly seems to add a splash of diversity to the cast. It’s not as broad as it could be, but there is a limited roster of characters to work with since everything else in the game is either abstract colour grids (for the spymasters) or nouns from the dictionary. It’s a good performance given how little scope there is with the artwork to offer much room for innovation. It could still have been better of course but there is almost always going to be some scope for improvement. We shouldn’t let that take away from an excellent performance when we see it. Forgive me, I’m an educator – we’re almost professionally obligated to temper praise with actionable critique. Codenames comes in at around an RRP of £16, and I’m not lying when I say there is almost limitless replayability in the box. The nature of the linguistic word play and the sheer variety of decks and spymaster grids means that every single instance of the game presents a different puzzle. It plays okay with two players, and scales all the way up to eight. If you want to play it, you’re almost certainly going to be able to find opportunities to do so. It does work better with larger player counts than smaller ones though which is something to bear in mind. If you hanker for a quick burst of play though all you need is one other player. 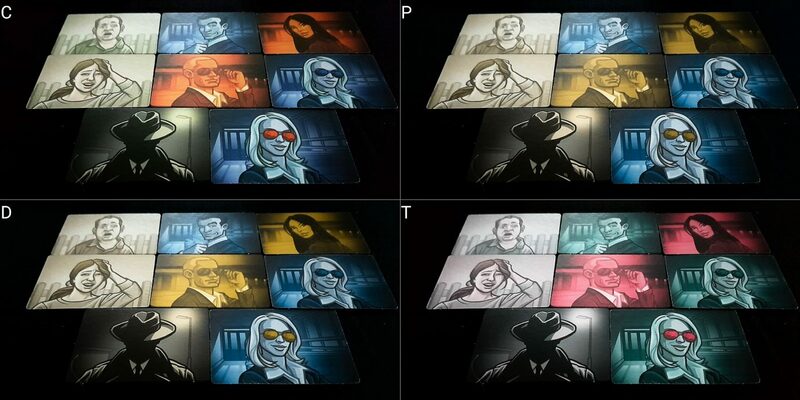 While a good job has been done in adopting a colour-blind sensitive approach to the visual design, the symbols used on the spymaster cards are not sufficiently distinctive to compensate in situations where severe colour blindness is paired to other categories of visual impairment. However, the necessary intersection of conditions is extremely rare – it’s really only going to be a problem for players with full monochromacy. In any case, a little initial setup with a spreadsheet will solve these problems without much additional work. Otherwise, the only issues we really need to discuss are the ones common to pretty much every game. Setup and teardown of the game is very brisk, and individual runs through are around ten to fifteen minutes. This means it fits tremendously well around conditions where there may be modulating severity of symptoms. If you want a longer game experience, you simply play it multiple times – all you need to do is deal out another 5×5 grid and a solution square. It’s tremendously quick. Dropping in and out is elegantly supported when in teams of more than two players, but not so elegant when a competitive game is forced to become a co-operative one. However, with a fifteen minute playtime it’s not as if starting again is going to rob anyone of significant progress – you can abandon the current game and reset for a smaller play group without much in the way of loss. When playing co-operatively, players can hopefully rely on each other to keep them right in situations where an impairment has led to an opportunity or a risk being missed. The stakes are so low in the competitive form too that it seems unlikely that players will be particularly inclined to allow others to suffer from accessibility related mishaps. The short play-time means that nobody has anything particularly bound up in the game that they will be reluctant to sacrifice in the name of fair play. This is obviously group dependent, but the nature of Codenames itself does a lot to mitigate the accessibility problems that may come from hyper competitiveness. Codenames does a rather good job in the accessibility teardown. It is though fundamentally a somewhat challenging game of communication within constraints and its grades in several categories are an unavoidable reflection of that. We like Codenames enough to give it three stars in the review but it’s never fizzed for us the way it has for so many other people. We’ve got more that is congratulatory to say about it in the teardown though. It’s hard to see how it could realistically have been much better without being a considerably different game. Almost everyone loves Codenames – its popularity seems like it’s only going to grow as time goes by. As such, it’s good to see that a wide audience of people will likely be able to meaningfully enjoy what it has to offer. Now get to a safe distance, agent. This teardown will self-destruct in fifteen seconds. I’m really glad that it was a conscious part of the design – I am a big fan of being able to be positive about games here, although it probably doesn’t look like it very often. This is one of a handful of games where I could realistically say ‘You’ve done about as well as could be hoped for’ – anything else would change the game considerably. It would have been better if the text on the code cards was more “even” as they are much more readable from one direction than from 180º the other direction.